“This Center is the work of the Southcoast administration, whose unwavering vision for great community care drives this system forward. It is the work of the skilled and dedicated medical staff whose commitment to excellence is unparalleled. And it is the work of a community that will accept nothing less than the very best care for their families, friends and neighbors, and who support the Southcoast mission with their treasure and their time,” said Jean MacCormack, Chair of the Board of Trustees of Southcoast Health System and Southcoast Hospitals Group. The hybrid OR is a cardiovascular surgical theatre equipped with advanced medical imaging devices to enable minimally-invasive surgery while bringing together doctors of different disciplines in the same operating room. The hybrid OR will support Southcoast Health’s structural heart procedures, vascular surgery and endovascular medicine. The new electrophysiology lab will be dedicated exclusively to performing more advanced procedures, such as cryo-ablation and convergent hybrid ablation for patients with atrial fibrillation. Southcoast is also currently one of only three hospitals in New England implanting Watchman, a device that reduces stroke in AFib patients and allows them to discontinue use of blood thinners. According to the CDC, an estimated 2.7 to 6.1 million people in the United States have AFib. In 2012, Southcoast discharged more than 700 atrial fibrillation cases, the second highest number of all the state’s hospital systems. “This Center was built on a longstanding promise that the best cardiac care anywhere would be available right here at Southcoast Health. A promise that our patients and our families would not have to travel to Boston for even the most sophisticated and innovative procedures. Today, this promise has been fulfilled and renewed yet again,” said Keith Hovan, President & CEO of Southcoast Health. 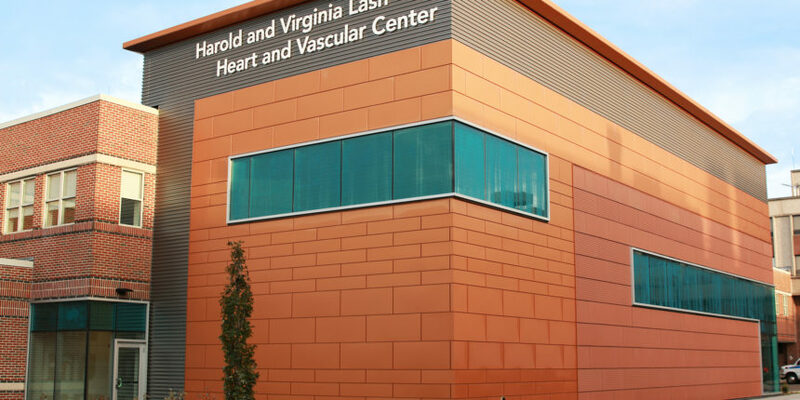 The Harold and Virginia Lash Heart and Vascular Center will cost approximately $14 million to complete. Southcoast Health is currently conducting a major capital campaign in support of the new facility. The construction was made possible in large part by a donation from the Harold and Virginia Lash Trust and other major commitments from the Auxiliary of Charlton Memorial Hospital, BayCoast Bank, Anesthesia Associates of Massachusetts, BankFive and the Oliver S. and Jennie R. Donaldson Charitable Trust. “As we look to the future, and continue to strive for excellence, the Harold and Virginia Lash Heart and Vascular Center will always be the place where our community will find the latest and best in cardiovascular care – the care our patients deserve, right here, close to home,” said Dr. Margaret Ferrell, Physician-in-Chief of Cardiovascular Services at Southcoast Health. The multi-level, 6,700 square foot center was designed by JACA Architects and built by Timberline Construction Corporation.